For many families who immigrate to the United States, the road to citizenship can be a long and arduous process. This is the case for many of the residents at Grace Apartments in Denver, Colorado where the population is comprised of refugees and immigrants primarily from Southeast Asia including Bhutan, Nepal, and Burma. The naturalization process starts with applicants becoming lawful permanent residents for five years. Lengthy application forms, hefty application fees, and language barriers can prove to be hurdles for those trying to navigate the immigration system. Mercy Housing Colorado recognized these challenges within its own community and wasted no time taking action to provide resources for residents. 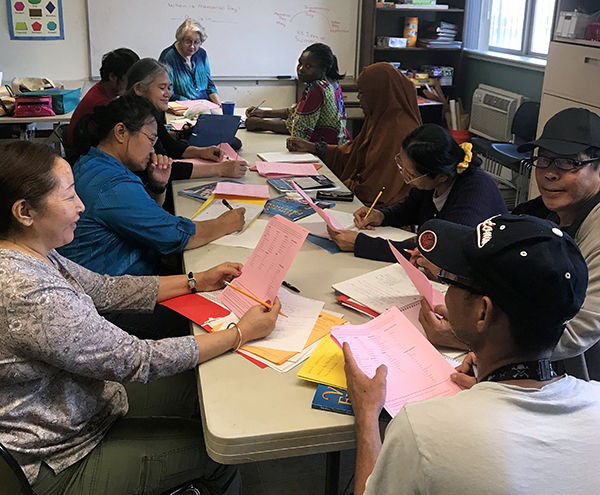 Last month, Mercy Housing Colorado, began working with the Spring Institute for Intercultural Learning, hosting an eight-week citizenship class. Spring Institute is a nationally recognized nonprofit organization with a mission to empower people and organizations to succeed across languages and culture. Tiffany, the Adult Education Program Manager at the Spring Institute, explains the importance of these partnerships. The class meets and assists residents as they complete the extensive application for naturalization and supports residents as they prepare for the U.S. Citizenship Test. The test includes an in-person interview, and a reading and writing exam. Applicants are also tested on their knowledge of American civics. Currently, there are seven residents and four community members participating in the citizenship classes at Grace Apartments, and they are taking advantage of this valuable resource and partnership. They all hope to become United States citizens soon. “Being able to attend a free citizenship class at Grace Apartments will make a huge difference in the participants’ ability to complete Form N-400 and pass the citizenship test. Even after just a few weeks of classes, I have noticed a difference in confidence in speaking among the class participants. I have no doubt that they will continue to improve and grow during the remaining three weeks of class,” Talie, Resident Services Coordinator at Grace Apartments.